Best viewed in 1024 x 768 pixels resolution. Lectures Schedule for March 16 2019 - July 14 2019. Spirituality: Proclaiming the word at Mass is a proper ministry of the church. It takes its place in the spirit of full, active and conscious participation in the celebration. Each one chosen for this ministry should have a good understanding of the ministry: that God speaks to us through us. The Lector is the one who is being used by God to communicate the word to everyone. Given this awareness, it=s incumbent on Lectors to have a proper disposition: one of respect and reverence for the Word and its proper proclamation. If this is so we should prepare ourselves by reviewing the readings during the week, preparing them for presentation and being sensitive to phrasing and problematic word pronunciation. Always come groomed and dressed appropriately. We don=t have to dress to the nines but we do need to wear better than average clothes - what we traditionally called our Sunday best. We strongly encourage you to come prepared regardless of the schedule. Many times readers run into circumstances at the last minute and cannot fulfill their commitment - so we have to ask someone right on the spot! Arrive at least fifteen minutes ahead of the celebration and ensure the Lectionary and related materials - greeting and intercessions - are properly placed. One Lector (First reading) come in procession holding the BOOK OF THE GOSPELS. It is held high as a sign that God=s word is moving through the congregation. Upon arrival at the sanctuary, the Book is placed on the altar in the usual way. Take your place in the congregation. Come forward once the opening prayer has been completed. No bowing is called for - go straight to the Lectern. The LECTIONARY should already be on the Lectern and opened to the correct reading. Begin - pace yourself, go slowly - proclaim the word rather than reading words from the page. Good eye contact, proper expression, proclaim with passion. At the end - pause - looking straight at the congregation say: The Word of the Lord. Response is: Thanks be to God. Return to your place for the singing of the psalm. If the psalm is not being sung, stay to recite it. In that case you would simply state the refrain and everyone would repeat it. Read slowly, deliberately and pronounce the word well - proclaim it. At the end of the reading - pause - then, looking at the congregation, say: The Word of the Lord. Once the Priest stands and the creed is recited, come forward. The Priest will introduce the intercessions and you begin by saying: Lord, hear our prayer. Everyone responds in kind. Once the intercessions are completed, stay in place until the Priest completes the concluding prayer. Then return to your place. Thank you for your ministry. Note: While prayers are being said, there should no unnecessary movement - everyone holds their position. The same thinking applies generally as to Lectors: Come properly disposed - grooming, dress etc. Come well in advance, be prepared to participate even if you are not scheduled - sometimes things happen and we may have to ask for volunteers. During the singing of the Lamb of God, come forward and stand behind or beside the altar. The Priest will present you with the communion dish or chalice plus the purificator. If you are distributing the hosts: Hold the host straight at the communicant, make eye contact and say: The Body of Christ - clearly and audibly. Communicant replies: Amen. Place the host on their hand or tongue as presented. If you are administering the chalice: Hold the chalice up and looking at the communicant say: The Blood of Christ. Communicant replies: Amen. Rotate the chalice after each communicant receives - wiping as you go. In the case of children - they should receive from the cup only under parental direction. Once the rite is completed, return to the credence table, cleanse the vessels in the usual way then return to your place. Be very careful on the steps. Thank you for participating in this special service at the celebration of Mass. It is, indeed, a privilege to be called into this ministry in virtue of our baptism. 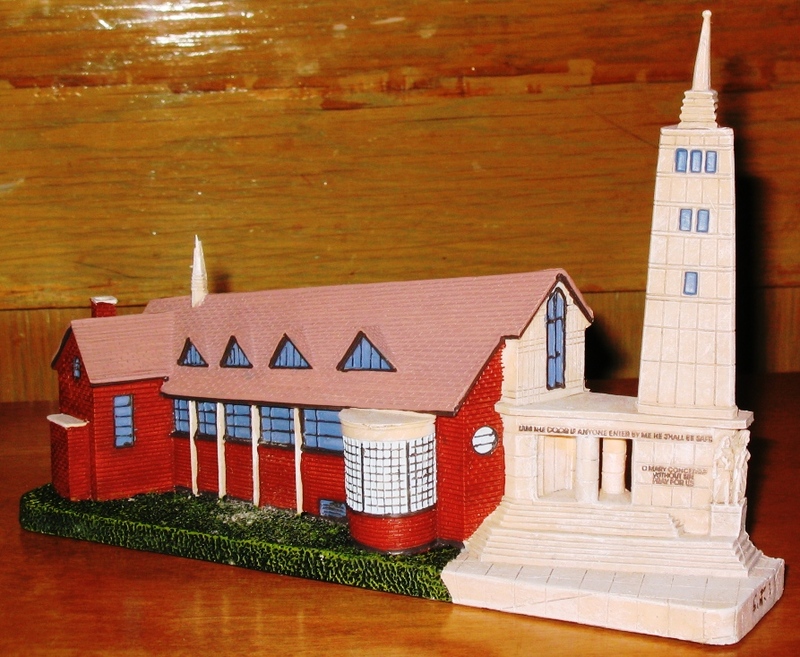 These miniature sculptures designed by Catherine Karnes Munn are available at the parish office or sacristy. Cost $25.00 each. Now in stock a supply of Christmas Cards and Wooden Rosaries. Also, the Living Faith Booklets for the first quarter of 2011 are now available at a cost of $2.00 each. For more information, contact Kitty Kelly at 639-9387. We are in need of more readers and communion ministers especially for the Saturday and Sunday evening Masses. Please give us a call if you are willing to participate in this way. There are boxes at the entrances to the Cathedral for these items. The used eye-glasses are forwarded to Third World Countries and the cash register receipts from Colemans, Dominion and Sobeys and labels from Campbells products showing the bar codes are used for fund-raising for Immaculate Heart of Mary School. ©2004 - 2012 Holy Redeemer Parish and its licensors. All Rights Reserved.